Mrs Moore is looking to marry off her son Ronny, a magistrate in colonial India, and she thinks she’s found the perfect candidate in eligible bachelorette Adela Quested, who she brings with her on a trip to the subcontinent. Mrs Moore is fascinated by India. It is not the passing curiosity of many of the British ex-pats she meets, who view their leisurely lives as an extended safari in the sun where they have become largely inured to the charms of the local wildlife, even if they haven’t grown tired of the fine weather. Out alone, Mrs Moore encounters (and impresses) a young, lonely, widowed Indian doctor called Aziz. Adela and Ronny are a complete mismatch and she knows it. He may be the kind of husband she ends up settling for (eventually), but there is no spark there. He enjoys the life of colonial authority far too much for her. Even his mother is faintly embarrassed, given her growing friendship with Aziz. Adela would be far more suited to Aziz’s friend Cyril Fielding, who is quite unlike any other British person any of them have met in India before. But a group outing to some remote caves tears this unlikely group apart. Nobody knows quite what happens. Adela comes running out of one cave in great distress, and Aziz is promptly found in there holding her glasses. Conclusions are jumped to. Aziz is arrested. With British prejudices and Indian resentment coming to the fore, the comfortable society the likes of Ronny have created is revealed in all its true colours. But he will be surprised by some of the people who choose the ‘wrong’ side. The novel’s moment as political comment is long gone, of course, but its continuing interest value isn’t solely as a historical snapshot of the uneasy stability of the British Raj. The empire may have gone, but the characters haven’t; they’ve just come home. Despite its prescient predictions of independence, twenty years ahead of time, this is not so much a novel about India anyway. It is about British society, its prejudices and peccadilloes, its superficiality, and all the other things that make it infuriating but fascinating. That’s still as true today as it was 90 years ago. 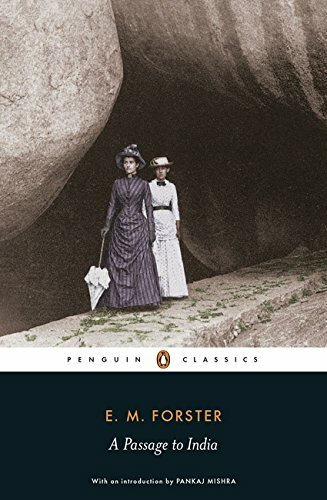 The novel has the plot of a novella, but E M Forster allows his characters to ramble (literally and figuratively). At university I read his Aspects of the Novel, which was recommended reading to creative writers because of the way he gets beneath the surface of how fiction works, without a surfeit of literary pretension like too much custard on the pudding. He railed against characters that are simply ‘dummies’, riding the plot wherever it goes. But I’m not quite sure he’s avoided that here. One character dies at the most convenient moment for the plot, ratcheting up the dramatic tension just when it’s needed. And in one of the final scenes, Aziz and Fielding hold sway on India’s future, but their mutual realisation of the true nature of their relationship is somewhat lost behind their becoming mouthpieces for Forster’s pontificating on the Indian question.